Summer has definitely come and gone for us. Salt Lake has completely transitioned to fall – one of my favorite seasons here. Once the school year begins, Zach’s free time dwindles and we don’t have ample opportunity to flit about. Fall break (10/9-13) gave us a chance to get out of town and discover a new city (and state). When we flew to Macau in April, Delta had serious problems/staff shortages due to storms in and around Atlanta, their hub. As a result, our flight out of Salt Lake was delayed for several hours and we missed our flight to Hong Kong. We ended up arriving in Macau a day later than we had initially planned. As a result, Delta gifted us with free miles. 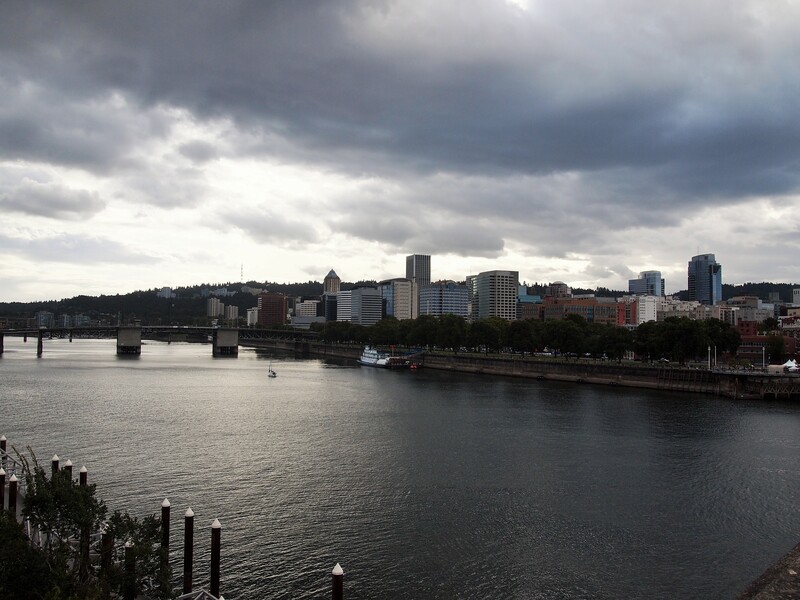 It was enough to get us to Portland and back for free! So this getaway was a happy surprise. 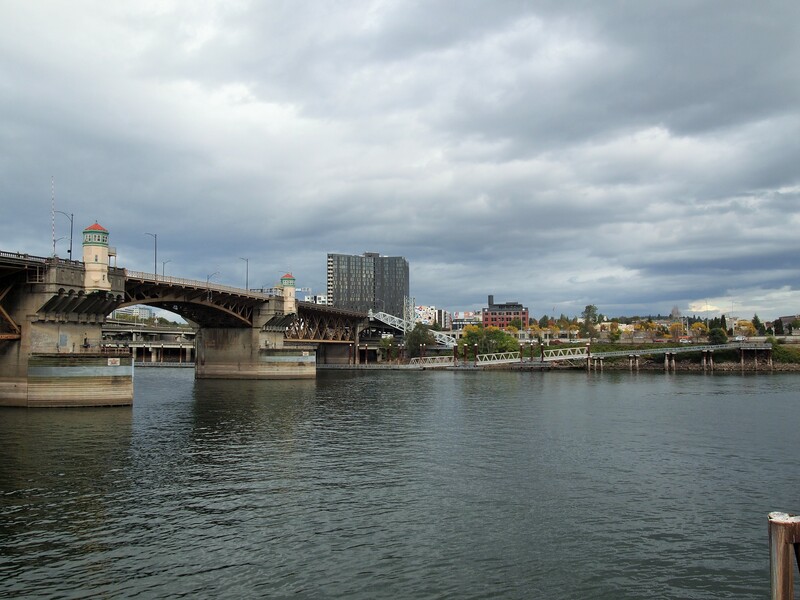 We left Salt Lake on Saturday morning and arrived around 1pm in Portland. The first order of the day was to eat lunch. 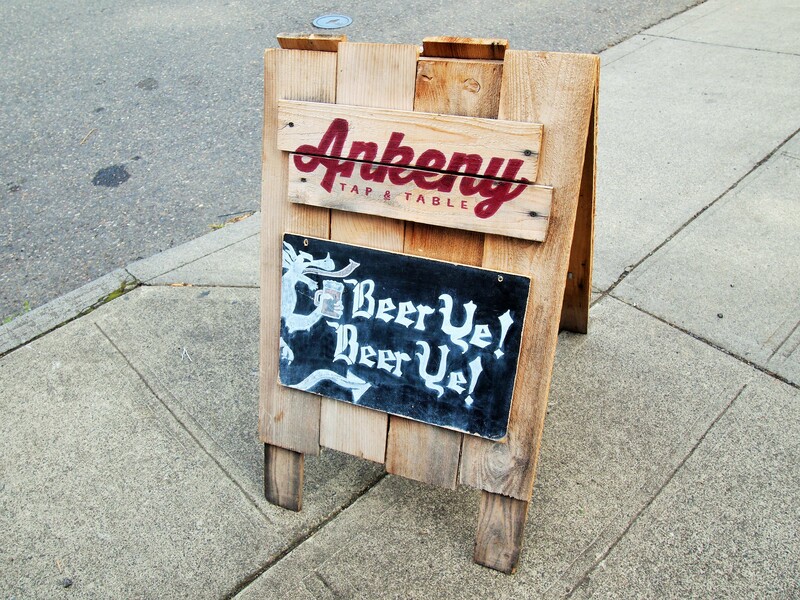 We dropped our bags at our Airbnb and walked to nearby Ankeny Tap and Table. Situated at a corner table near the open garage door, we had a nice view of the street for people/dog watching while we enjoyed a delicious lunch and our first local brews. 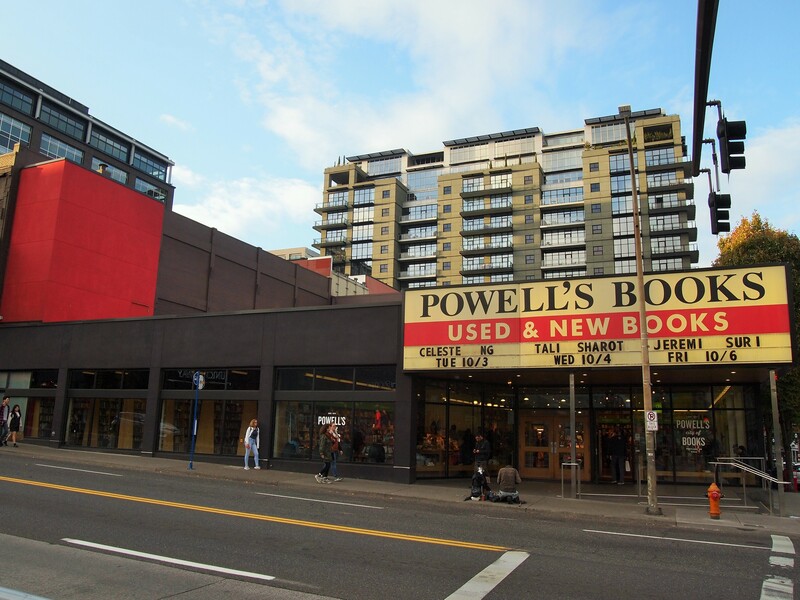 Without much of an agenda for the day, we decided to go downtown to wander around the weekly Saturday Market and visit Powell’s Books flagship store. 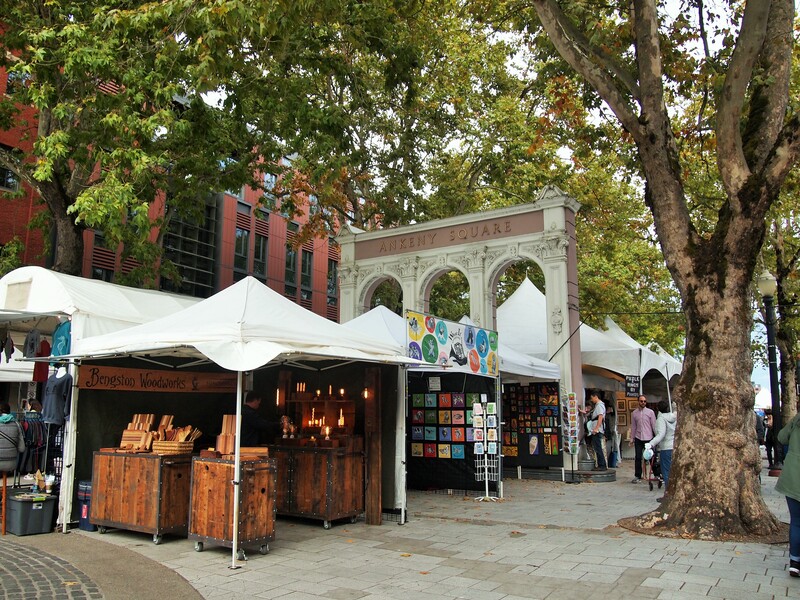 The Saturday Market, located off the Willamette River in Waterfront Park and adjoining Ankeny Plaza, has been in operation since 1974. It’s the largest and longest running arts and crafts market in the country. Though, contrary to its name, the market is held on Saturdays and Sundays. 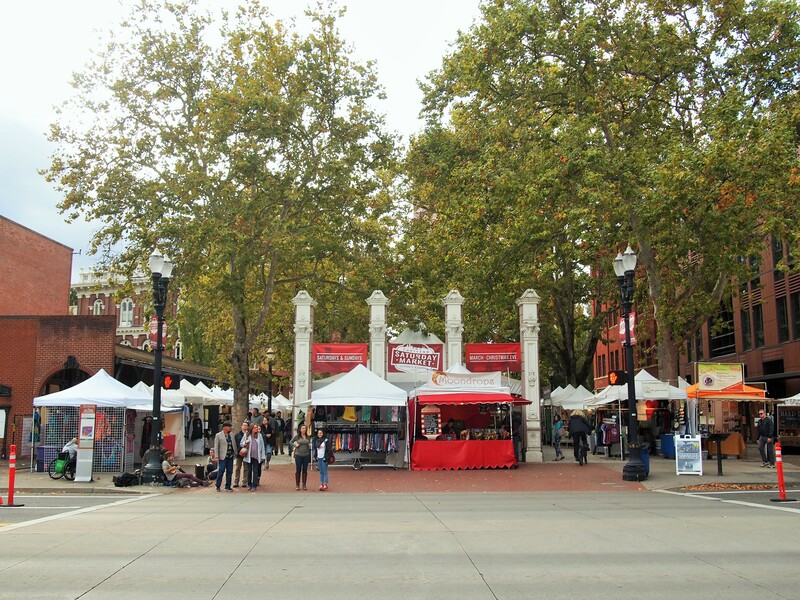 We ambled through the stalls admiring eclectic spoon and fork designs, wood carvings, and snarky t-shirts before leaving empty-handed in the direction of Powell’s. 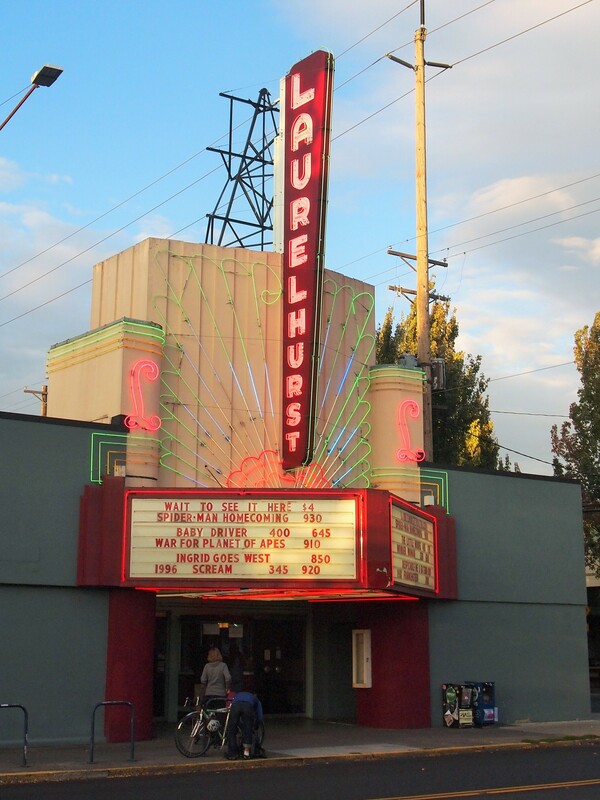 After scouring Powell’s for a while, we caught a bus back to our ‘hood of Burnside and 28th Ave. to catch a movie at the Laurelhurst Theater. The theater was built in 1923 and shows second-run films at a discounted price. They have pizza and beer on tap too. Similar to Alamo Drafthouse, some rows of seats have been removed to allow for a table on which to set your food or drink. After the movie (Baby Driver), we walked over to Migration Brewing for a couple of drinks before calling it a day. 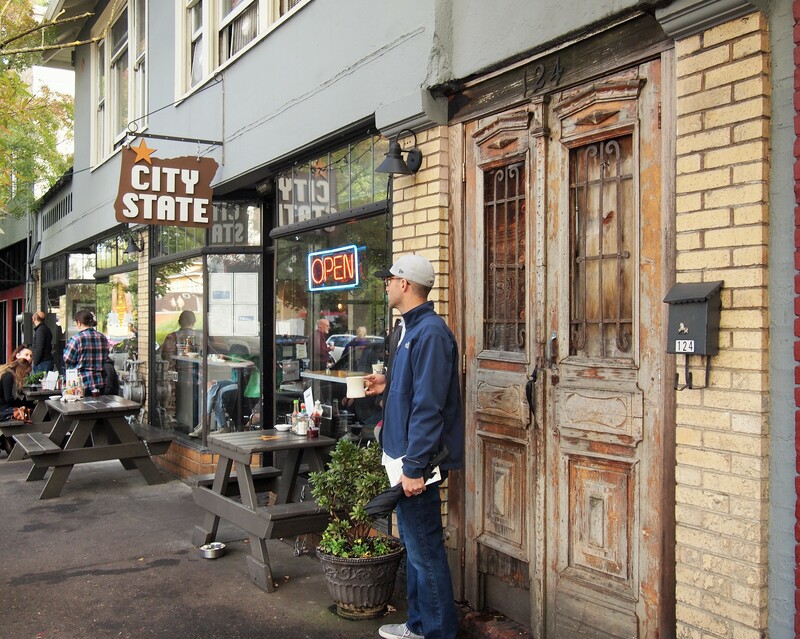 On Sunday morning, we started with a filling breakfast at City State Diner. Though drizzling on our way to the diner, the weather soon cleared into a beautifully sunny day. After breakfast we ventured over to Washington Park on the western side of the city. 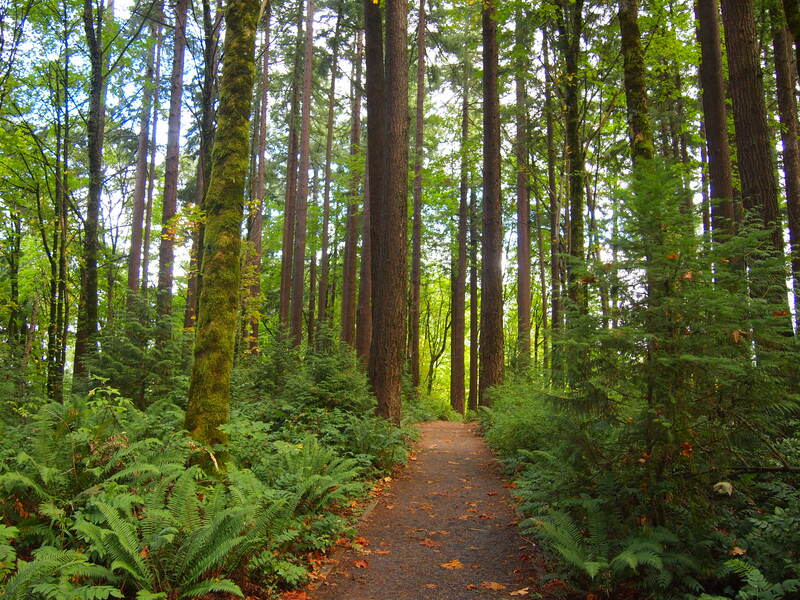 Washington Park is one of Portland’s oldest parks. 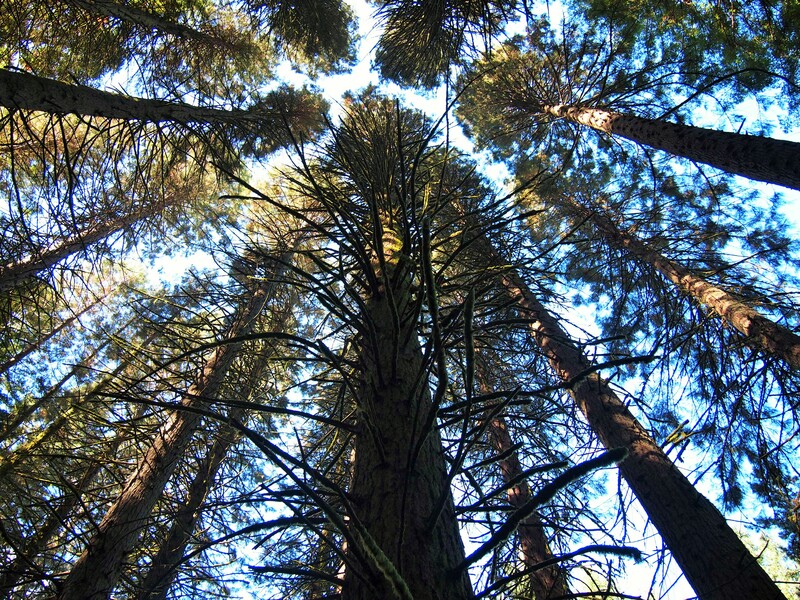 It was originally designated the City Park in 1871 when it covered only 40 acres of land; today it totals 410 acres and houses many of Portland’s attractions: The Oregon Zoo, Hoyt Arboretum, The International Rose Test Garden, The Portland Japanese Garden, The Portland Children’s Museum, and The World Forestry Center. 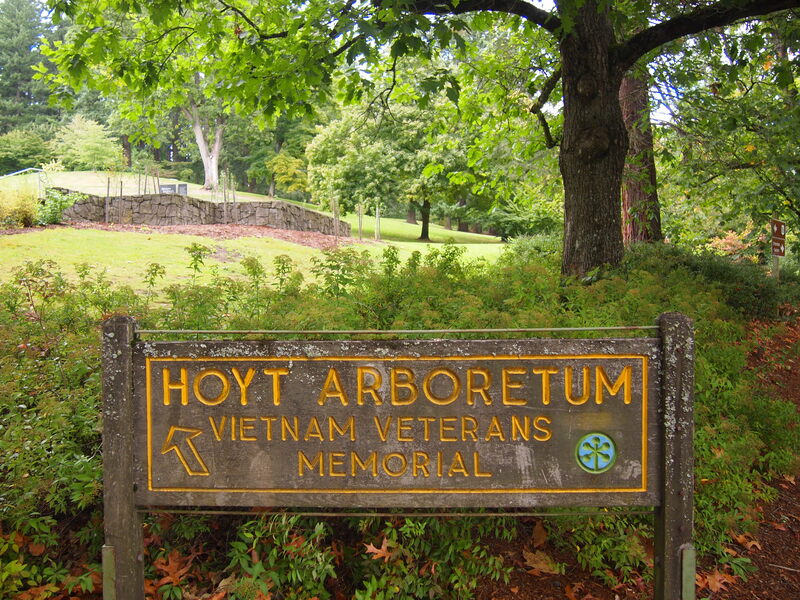 Hoyt Arboretum comprises 189 of Washington Park’s total acreage. The arboretum contains over 2,000 species of trees giving scientists and visitors alike access to an incredible outdoor laboratory. 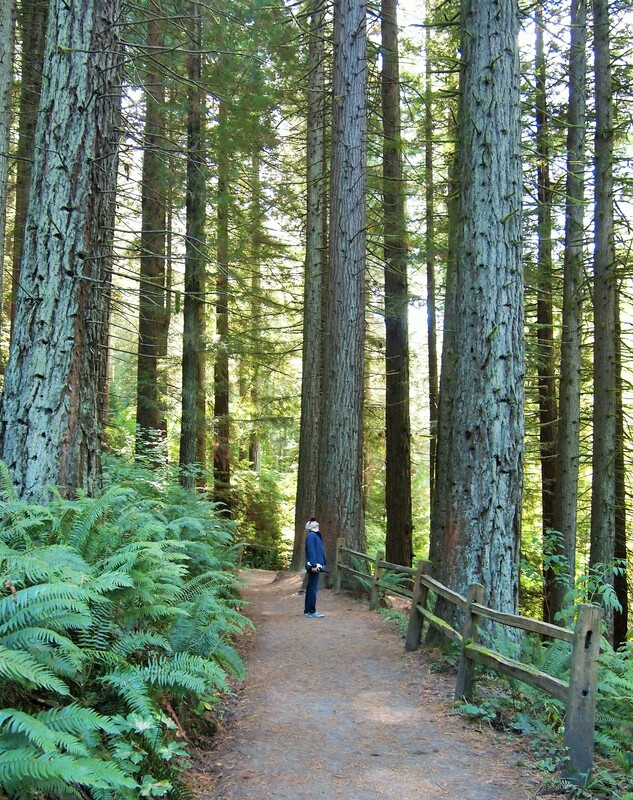 There are 12 miles of trails which take visitors through varying tree families. 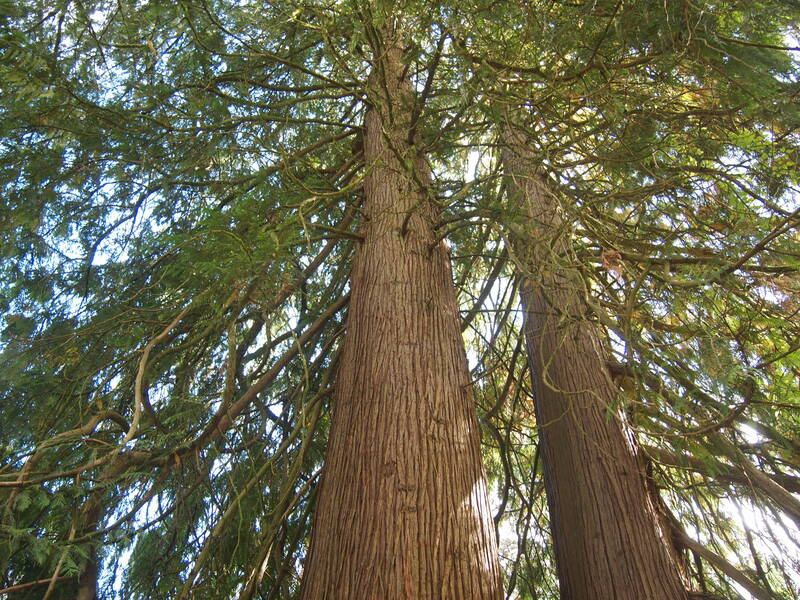 We walked part of several different trails while meandering through the arboretum – maple, fir, redwood – before ultimately using the Wildwood Trail to lead us to our next destination, the Pittock Mansion. 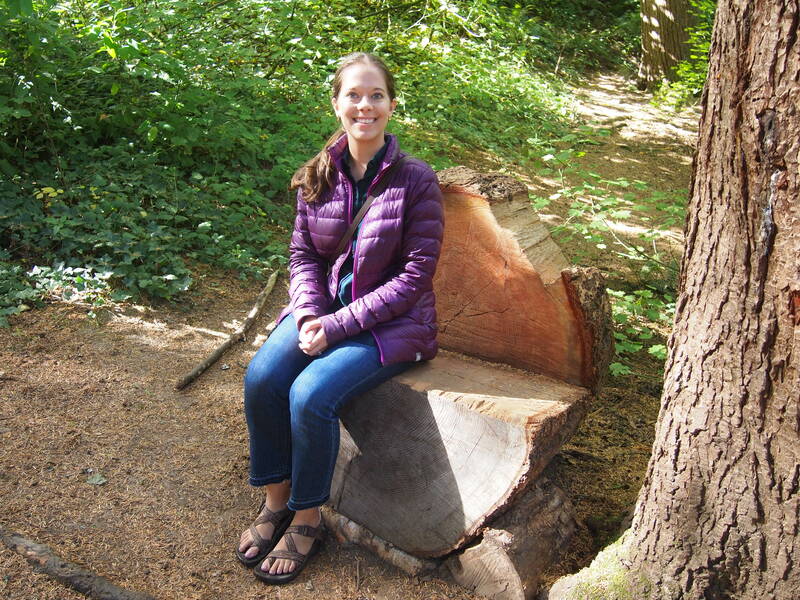 I loved the arboretum. 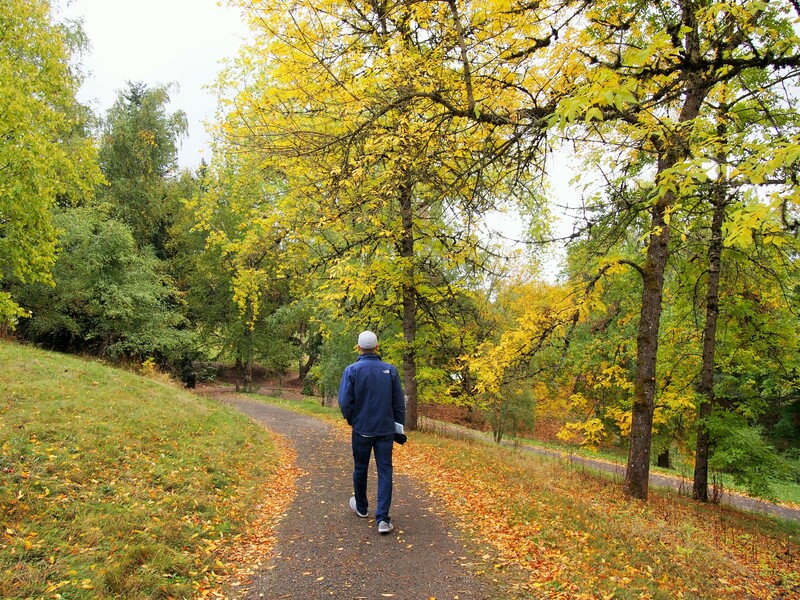 It was perfect for a fall stroll but its miles of trails and diversity of plant life would accommodate any season. 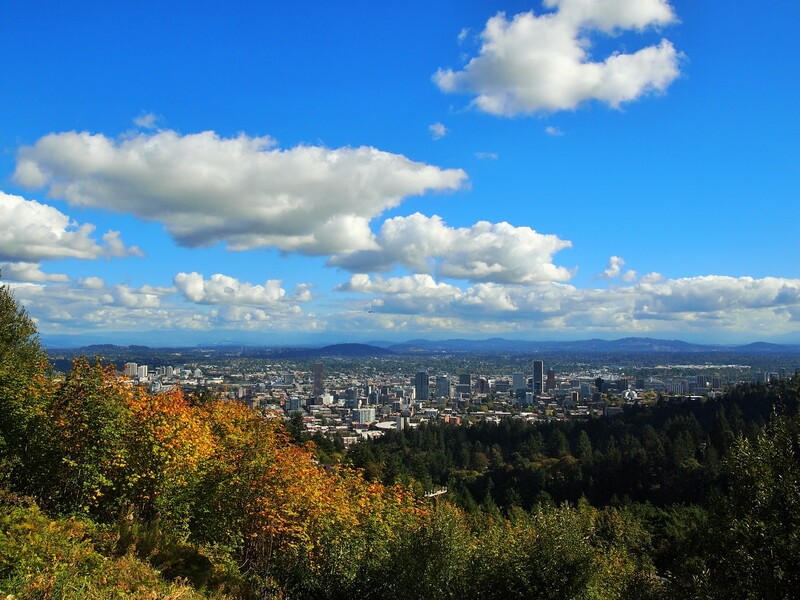 The Pittock Mansion sits on a hillside overlooking the city. 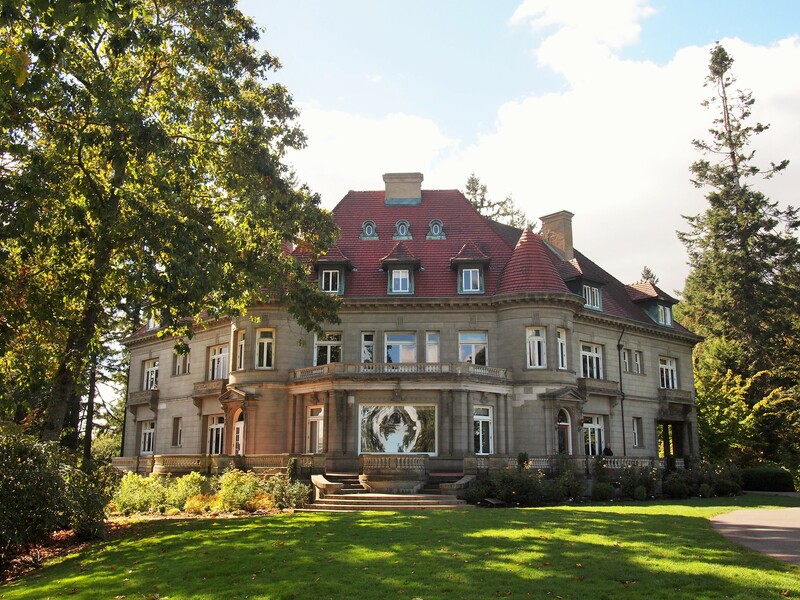 Built in 1914 by Henry and Georgiana Pittock, the home is now owned by the City of Portland. Admission is a little steep at $10/adult, but it was worth being able to tour the house. (Many visitors simply come for the view.) I was disappointed to find that much of the mansion wasn’t furnished by original Pittock items. Rather, the house is more like a museum to the time period giving visitors a glimpse at how the rooms could have been decorated and furnished. Most of the house is available to tour except some of the basement storage areas. I particularly enjoyed the bathrooms; stylish furnishings come and go but bathrooms remain essential. 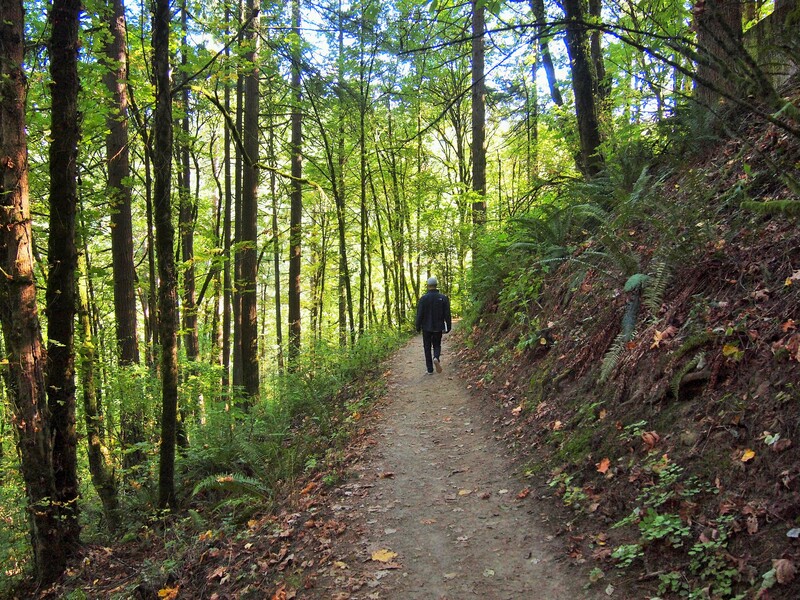 Instead of going all the way back to the arboretum, we took the Wildwood Trail down to Burnside St. and caught a bus. 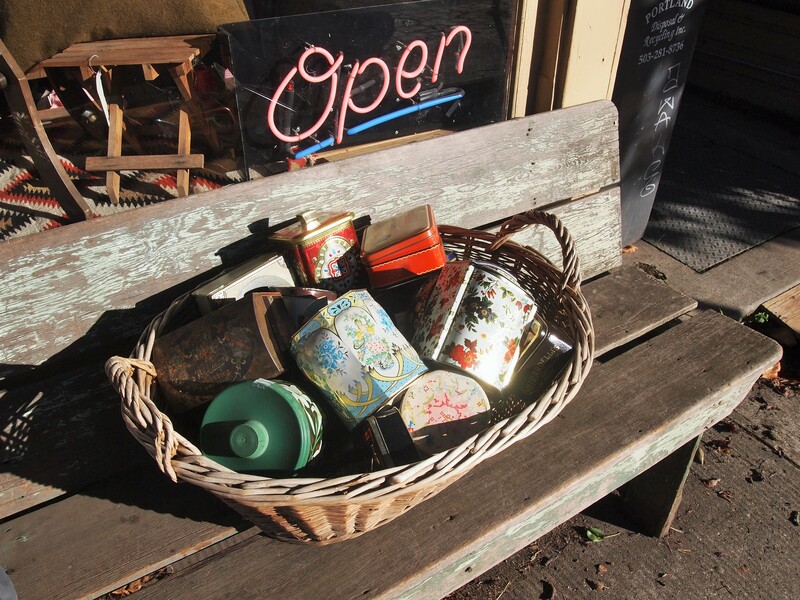 Next up on our agenda: antique stores in Sellwood. 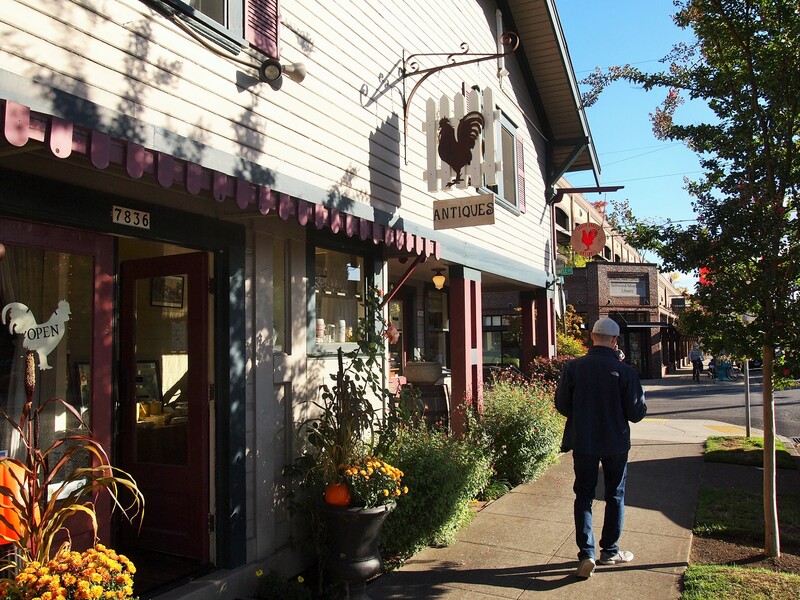 Once its own town, the Sellwood-Moreland district is known for streets lined with antique stores. We thought Sunday would be the perfect day to stroll along and duck into whichever stores caught our fancy. Unfortunately, we arrived a little late in the afternoon so we were short on time, but we were still able to make the most of it. Certainly a return trip will be in order. 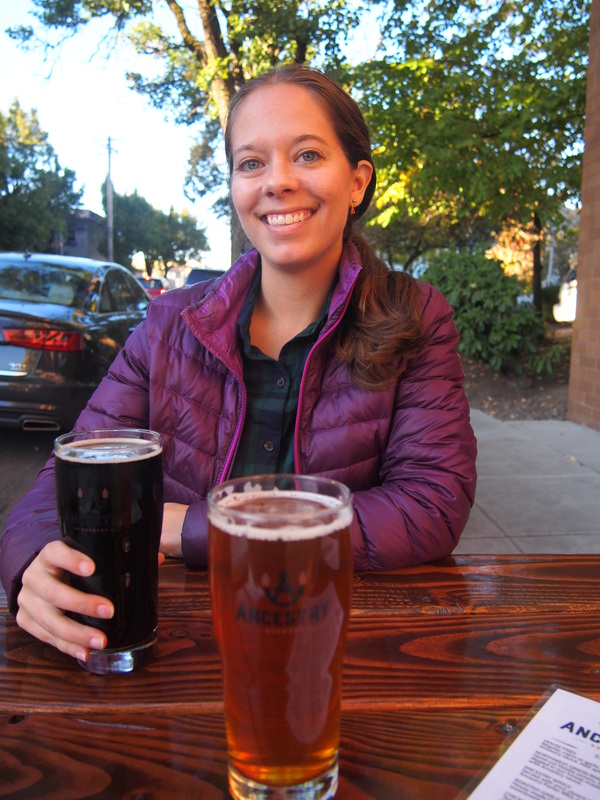 We browsed in a couple of stores before we came upon The Portland Bottle Shop and decided to take advantage of the sunny sidewalk seating for a drink. 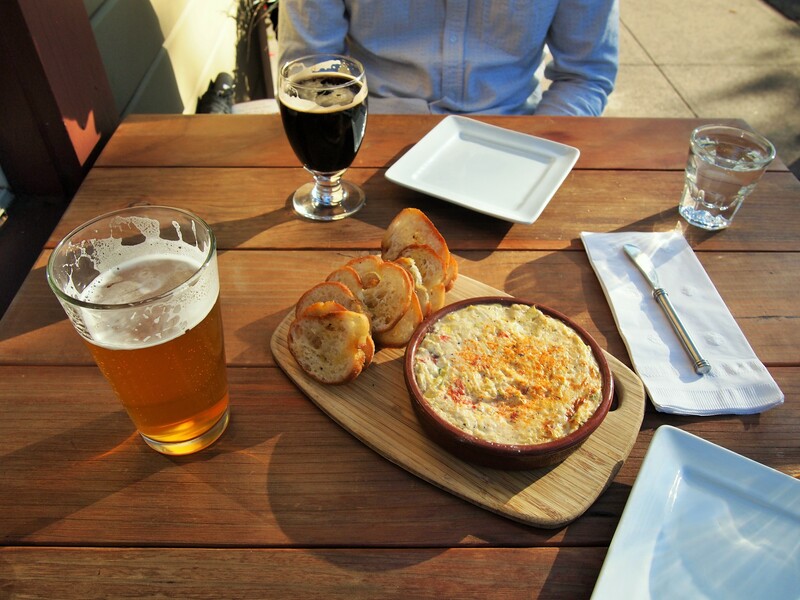 We had a spinach artichoke dip, savored some cold beers, and people-watched before continuing down the street. By that time, most of the stores were closed/closing, including one which seemed to contain only dachshund-themed gifts. DARN. 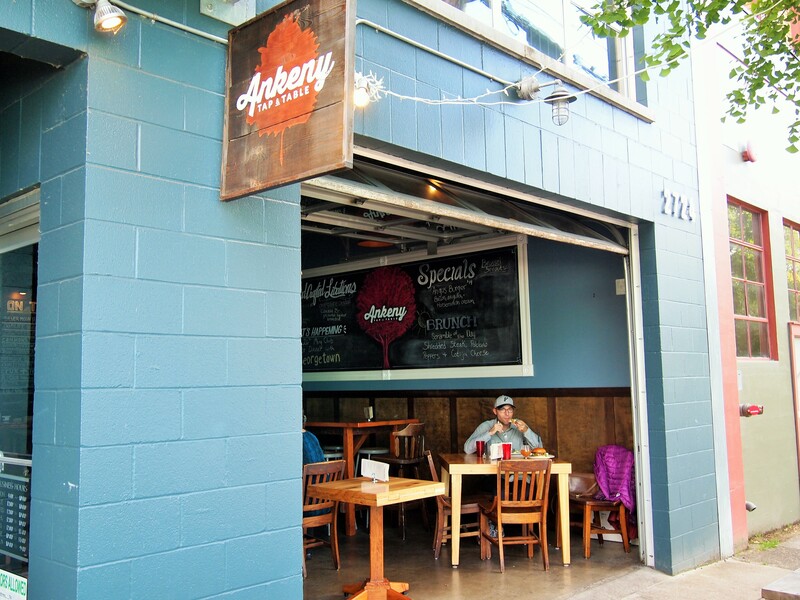 Luckily, not too far down the street we stumbled upon Ancestry Brewing and were able to console ourselves with a couple pints and fried salmon bites – yum! We did manage to find one more open store after we left the brewery and walked out with a pair of tiki glasses. Was I influenced by the ratio of beer to food in my body? Of course. Was it a good purchase? Definitely. We decided to walk a couple blocks over and then catch an Uber or the bus back into town. 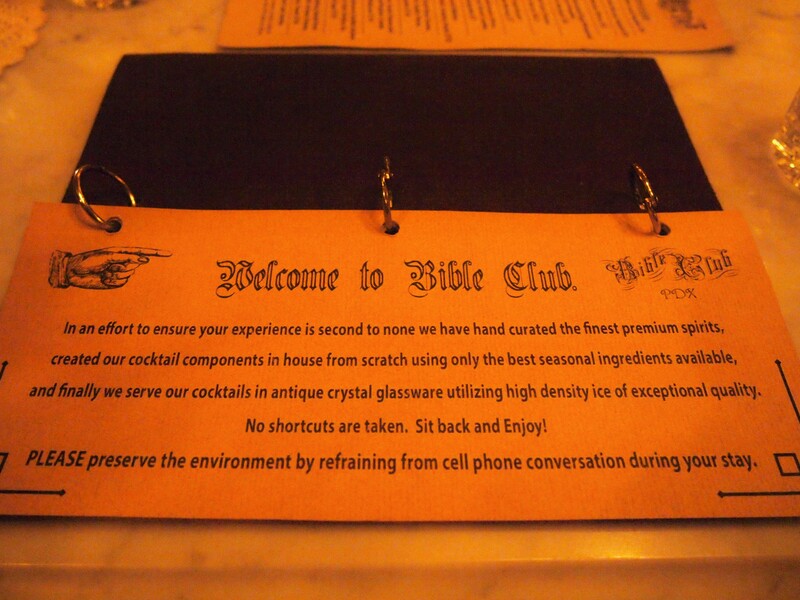 Zach opened Yelp on his phone and noticed that a bar called Bible Club was nearby. We were intrigued by the name and it was only a block away, so we decided to check it out. When we arrived, we were a little baffled. 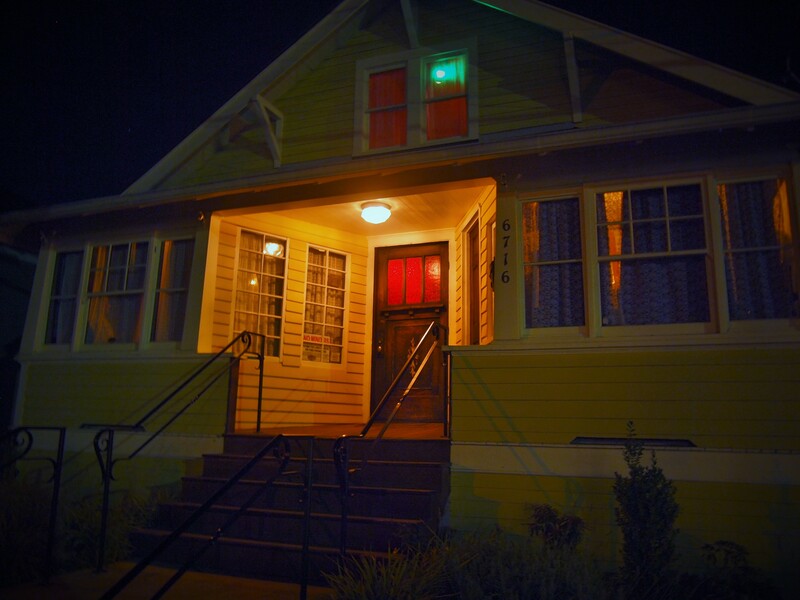 It was a yellow bungalow. There wasn’t a sign and it was rather unassuming, but there wasn’t another building around. So, we took a chance, opened the door, and inside found the most delightful speak-easy themed bar. All of the decor was prohibition era, even the American flags had 48 stars. It actually felt like we were in a secret bar. The bar was small, only 30 or so seats, and it felt clandestine. 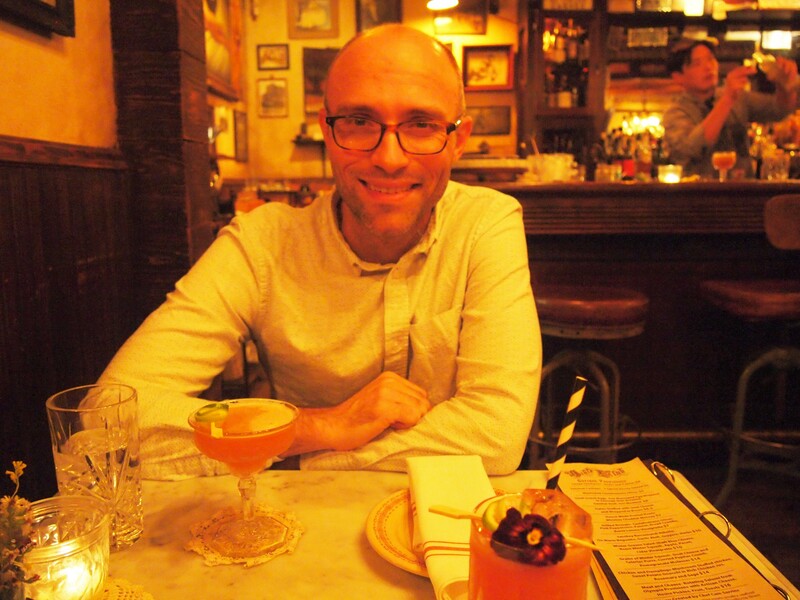 We each had a proprietary libation (cocktail) along with a dish of pretzel knots. Bible Club was quiet and cozy and truly wonderful. After Bible Club, we did catch an Uber back into town. 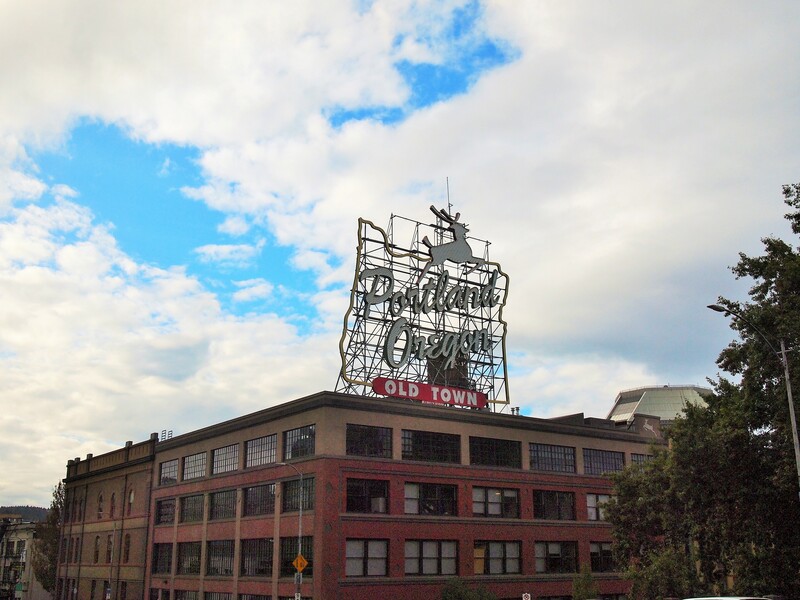 We rounded out the evening with a visit to the Hawthorne district where we stopped into Powell’s and had beers at Back Stage Bar, a McMenamins institution hidden behind their Bagdad Theater. The Back Stage Bar was pretty impressive. It’s a cavernous seven story space with a 20×20 ft. mural at the front. I wasn’t too crazy about their beer, but the space alone was worth seeing. 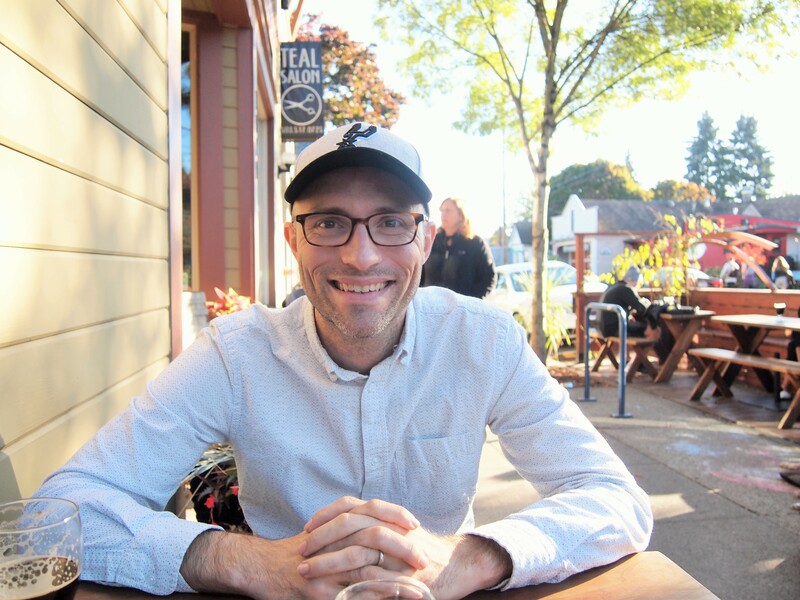 McMenamins is a local Oregon company which renovates historic buildings and turns them into hotels, bars, brewpubs, etc. 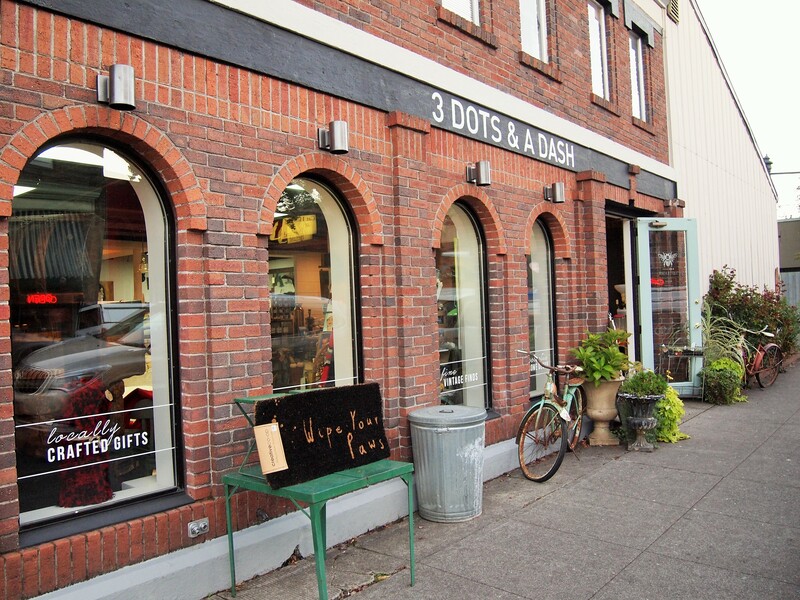 and has their hands in a little bit of everything – beer, coffee, wine, spirits. We noticed several McMenamins as we traveled throughout Portland and each seemed to have its own eclectic theme.